In recent years, the Iranian government states that it has self-sufficiency in essential military hardware and defense systems. Tehran established an arms development program during the Iran-Iraq war to counter the weapons embargo imposed on it by the US and its Western allies. Since 1992, Iran has manufactured its own tanks, armored personnel carriers, missiles, radars, boats, submarines,unmanned aerial vehicles, and fighter planes. From 1925 to the Iranian Revolution in 1979, Iran used to be equipped with the very latest Western hardware. Cases exist where Iran was supplied with equipment even before it was made standard in the countries that developed it (for example the US F-14 Tomcat, or the British Chieftain Tank). Primary suppliers included the United States, Britain, France, the Federal Republic of Germany (West Germany), Italy, Israel, and the Soviet Union. The Iran–Iraq War, and post revolutionary sanctions at the time had a dramatic effect on Iran's inventory of western equipment. Under the pressures of war, all supplies were quickly exhausted and replacements became increasingly difficult to come by. The war eventually forced Iran to turn to the Soviet Union, North Korea, Brazil, and China to meet its short term military requirements. Nevertheless, the experience of using quality equipment was not lost on any of the branches of the Iranian armed forces. Disappointed by the older Warsaw Pact equipment, Iran sought to develop its own ability to mirror the technology of its likely enemies, and to provide a totally reliable source of equipment for the future. After the Iranian revolution, developments in military technology were carried out with the technical support of Russia, China, and North Korea; building upon the foundations established by western contractors. Iranian reliance on these countries has rapidly decreased over the last decade in most sectors as Iran sought to gain total independence; A major exception however, is the aerospace sector, where Iran is still dependent on external help. Iran has, at present, reverse engineered existing foreign hardware, adapted it to their own requirements and then mass-produced the finished product. Examples of this abound, such as the Boragh and the IAMI Azarakhsh. In an attempt to make its military industries more sustainable Iran has also sought to export its military products, see Iranian Military Exports. This illustration shows a prototype of Iran's mobile air defense system, Bavar 373, with cylindrical containers. However, the final product, unveiled in 2016, is equipped with cube containers. Azarakhsh - modified copy of U.S. F-5 Freedom Fighter, one-seat fighter aircraft, and combat capable trainer. Saegheh - fighter aircraft. Second generation Azarakhsh with a twin canted tail configuration. Shafaq - advanced light fighter/trainer, still in development. Qaher-313 - Stealth single-seat multi-role combat aircraft. Parastoo - propeller-driven training aircraft. Reverse engineered Beech F33 Bonanza. JT2-2 Tazarv - third generation of the Dorna mentioned above. Still in prototype stage. Simorgh (aircraft) - training aircraft. Panha 2091 - overhauled U.S. AH-1J SeaCobra refitted with indigenous components. Toufan I,II - helicopter based on AH-1J and produced by Iran Aviation Industries Organization, 10 Toufan I were delivered to Army in May 2010.Improved Toufan II unveiled in January 2013. Shabaviz 2061 - overhauled U.S. Bell 206 JetRanger refitted with indigenous components. Bavar 2 - fixed-wing seaplane capable of patrol and reconnaissance missions. Ababil - Domestically-manufactured naval surveillance plane. Ababil-5 is for medium-range reconnaissance and surveillance missions and the Ababil-T for short/medium-range attack missions. Sabokbal - First Iranian super lightweight drone, capable of recording and dispatching films and can be prepared for flight in less than five minutes. Talash 1,2 - Iranian training UAV. Karrar - capable of carrying a military payload of rockets to carry out bombing missions against ground targets. It is also capable of flying long distances at a very high speed. A1 - A1 is capable of travelling for at least two hours, and can carry a 5-kilogram payload. Shaparak (Butterfly) - has a maximum operational radius of 50 kilometers (31 miles), and a maximum flight ceiling of 15,000 feet (4,572 meters). This UAV is capable of three and half hours of non-stop flying, and can carry an 8-kilogram (17-pound) payload. Shahed 129 - UCAV with 24-hour flight capability and armed with Sadid missiles. Sayeh - Reverse-engineered copies of ScanEagle, made on a domestic production line and put into service by the Iranian armed forces. Yasir - Modified version of ScanEagle, it has a 19,500 ft service ceiling, an endurance of 24 hours, and an operational radius of about 750 km. H-110 Sarir - capable of carrying air-to-air missiles. Hamaseh - A medium-range drone, capable of carrying air to ground missiles. Raad 85 - Suicide drone. Fotros - UCAV with range of 2000 km, flight ceiling of 25,000 ft and 16–30 hours flight endurance, armed with missiles. Iran claims to have upgraded its US-made F-4, F-5, and F-14 fighter jets, and produced spare parts including tires, avionics, and engine components. Shahed (Observer) flight recorder - able to record flight, image, and sound parameters. Shahed-278 and Bell-206 simulator - Under project Mansour Iran built 27 Bell-206 simulators in 2003. Bell 214 simulator - it was built under project Qader-3 and it had cost Iran 17 billion and 500 million rials. Asr radar - Asr radar is described by Iranian officials as a S band naval three-dimensional phased array radar with a range of 200 km and capable of simultaneously identifying and intercepting 100 targets at water level or above, this radar will be installed on Jamaran frigates. Ghadir - The Ghadir radar system which covers areas (maximum) 1,100 km in distance and 300 km in altitude has been designed and built to identify aerial targets, radar-evading aircraft, cruise missiles and ballistic missiles as well as low-altitude satellites. Arash - long-range radar, entered service in December 2013. Ghamar (3D radar) is an Iranian native production in electronic warfare. Medium-range missiles are considered to have a range between 1000 and 3000 kilometers. Shahab-3A/B/C - strategic MRBM with a range of 1,200 km to 2,100 km. Ghadr-110 MRBM with a range of 2000–3000 km. Ashoura missile 2 stage solid fuel MRBM with a range of 2,000 km. Sejjil 2-stage solid fuel MRBM with a range of 2000–2500 km. Emad - improved version of Shahab-3 with 500-meter precision. Short-range missiles are considered to have a range up to 1000 kilometers. Naze'at - Unguided rocket series. Qiam 1 - Tactical SRBM with a range of 750 km. Uses liquid fuel and has a smart targeting system. Nasr-1 - Iranian-made short-range missiles. Qader - Iranian anti-ship cruise missile with a range over 200 km. Ya-Ali - Iranian land attack cruise missile with 700 km range. Soumar - copy of the Raduga Kh-55. RPG-7 - Copy of Soviet RPG-7. Iran is forecast to manufacture 2.88 percent of the worlds RPG-7's by 2014. Tondar - Iranian made version of 9M119 Svir ATGM with max range of 4,000 meters. SM-1 copy of RIM-66 Standard. Sayyad-1 / Sayyad-1A - upgraded copy of Chinese HQ-2, Sayyad-1A has IR tracking. Sayyad-2 (Hunter II). Upgraded version of the Sayyad-1 system with higher precision, range and defensive power. It is equipped with a 200-kilogram warhead and has a speed of 1,200 meters per second. The Sayyad-1 missile defense system is composed of two-stage missiles that can target all kinds of aircraft, including bombers, at medium and high altitudes. Fath (victory) - the 40-millimeter naval cannon's range is 12 km and shoots 300 projectiles per minute. Mersad - Iran's first advanced air defense system based on the US MIM-23 Hawk. It is capable of hitting modern aircraft flying at low and medium altitudes. The Mersad system is equipped with sophisticated radar signal processing technology, an advanced launcher, and electronic equipment for guidance and target acquisition. 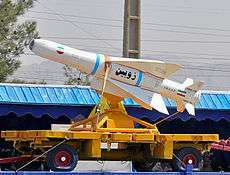 Mersad uses domestically manufactured Shahin missiles. Mesbah 1 air defense system - can target and destroy fighters, helicopters, cruise missiles and other objects flying at low altitude. Mesbah 1 is equipped with a three-dimensional interception radar and an optical guidance system. Mesbah 1 can fire four thousand rounds per minute. Mehrab (altar) - surface-to-air medium-range smart missile. The Mehrab missile is equipped with anti-radar and anti-jamming systems, and if the enemy tries to jam the guidance system of the missile, it immediately identifies the source of the interference and changes its course toward the source and destroys the jammer. Bavar-373 (under development). Iran's corrected version of Russia's S-300 surface-to-air missile system, which uses two or three types of missiles to confront aerial targets in different layers. Ya Zahra - Low-altitude mobile air defense system. Soheil - Quadruped- MANPADS missile launcher, which can detect and intercept aerial targets. Herz-9 - Passive low-altitude mobile air defense system with operating range of 10 km and operating altitude of 5 km . Asefeh - Asefeh is three-barrelled 23 mm Gatling gun that is reportedly capable of firing up to 900 rounds a minute, it is currently under development by IRGC ground force and will be used as a close in weapon system to defend against cruise missiles. Sattar 1/2/3/4 - Medium Range air-to-ground missiles. Asre - Laser-guided air-to-ground missile. Kite - Stand-off sub-munitions dispenser. Yasser - 750 lb air-to-ground missile. Bina - Laser-guided air-to-ground and ground-to-ground missile according to Janes It appears to be an AGM-65 Maverick air-to-ground missile with a semi-active laser (SAL) seeker fitted to its nose. Sadid-1 - Light air to ground missile. Fakour 90 - Iranian version of AIM-54 Phoenix, it was successfully tested on February 2013. Ra'ad - Indigenously developed long-range anti-ship missile based on HY-2 Silkworm. Fajre Darya- copy of Sea Killer II. Tondar - upgraded copy of Chinese C-801. Similar to Noor but powered by solid rocket booster and range of 50 km. Thaqeb - Similar to Noor, modified for submarine launch. Noor - upgraded copy of Chinese C-802. Zafar - Indigenously developed short-range anti-ship missile. Hoot - A supercavitation torpedo. Possible copy of the Russian VA-111 Shkval. Mobarez - Indigenous upgrade of British Chieftain. Sabalan - An Iranian upgraded version of the US M47M, It has side skirts and a newly built turret fitted with a 105-mm gun, laser range finder, new fire control system and communication equipment. Sayyad - Quick reaction vehicle for unconventional warfare. Tosan - Iranian light tank for unconventional warfare, developed from British FV101 Scorpion. Cobra BMT-2 - Concept vehicle for the Boragh armed with 23 mm anti-aircraft gun for use as a fire support vehicle. Hoveizeh - Ultra-light tracked APC. Vafa Mortar - 160mm mortar. Raad 1 - SP gun Chinese Type WZ 501/503 armored infantry fighting vehicle with Russian 122mm gun mounted on top. Basir - Laser-guided 155 mm artillery shell capable of engaging moving targets at the range of 20 km. Fajr 7 - artillery rocket with a range of over 64 km. Sayyad - Iranian Steyr HS .50 clone with slightly different muzzle brake and curved pistol grip. Shaher - Iranian developed caliber 14.5 sniper rifle. Arash - Indigenous 20 mm sniper rifle. Akhgar - Iranian made 7.62 mm Gatling gun capable of firing 4,000 to 6,000 rounds per minute. Moharram - Iranian made 12.7 mm Gatling gun capable of firing 2,500 rounds per minute. Sina class - heavily upgraded, French Kaman (Combattante II) class missile boats. Moudge class - upgraded and modified British Alvand (Saam) class (aka Vosper Mk 5 type) frigates. Jamaran - multi-mission frigate with a displacement of around 1,400 tonnes, can carry 120-140 personnel on board and is armed with a variety of anti-ship and surface-to-air missiles. Kharg - At a cost of $800 million, the new 13,000-ton vessel carries 12 Iranian strike helicopters, a crew of 200 and has a range of 8,000 nautical miles that reaches the US coast. There are five landing spots on its decks and four parking spots, as well as SM-1 and SAM anti-air missiles and 40-mm Fath-40 AAA anti-air cannon. ↑ "Iran has technology to make heavy aircraft: Vahidi". PressTV. 2012-04-30. Retrieved 2013-11-07. ↑ "PressTV - Iran unveils home-built combat drone". Presstv.ir. 2010-08-22. Retrieved 2013-11-07. 1 2 3 4 John Pike. "Tazarv / Tondar / Dorna". 1 2 3 "Commander: Iranian Air Force Highly Equipped". ↑ "Iran unveils its new home-made front control wing stealth fighter aircraft Qaher 313". Air Recognition. 2013-02-02. ↑ John Pike. "Iran 140 (Antonov 140)". ↑ Pike, John. "Simorgh". Globalsecurity.org. Retrieved 2012-01-21. ↑ "No Operation". Presstv.ir. Retrieved 2012-01-21. ↑ "PressTV - Iran unveils latest indigenous helicopter Toufan 2". Presstv.ir. 2012-12-12. Retrieved 2013-01-04. ↑ "Fars News Agency :: Iran Starts Using New Home-Made Combat Choppers". English.farsnews.com. Retrieved 2013-01-04. ↑ "New Iranian Attack helicopter Shahed 285 (PiX - Iran Defense Forum". Irandefence.net. Retrieved 2012-01-21. ↑ "FarsNewsAgency - ط®ط¨ط±ع¯ط²ط§ط±ظٹ ظپط§ط±ط³". Farsnews.net. Retrieved 2012-01-21. ↑ "New Iranian Attack Helicopter Shahed 285". YouTube. Retrieved 2012-01-21. ↑ "Stealth flying boats join IRGC fleet". PressTV. 2010-09-28. Retrieved 2012-01-21. ↑ John Pike. "Ababil (Swallow) Unmanned Air Vehicle". 1 2 "Iran to unveil new home-made UAV - Xinhua | English.news.cn". News.xinhuanet.com. 2012-01-31. Retrieved 2013-11-07. ↑ "Iran unveils home-built combat drone". PressTV. 2010-08-22. Retrieved 2012-01-21. ↑ "Iran to unveil new air defense system". Previous.presstv.ir. 2010-08-17. Retrieved 2012-01-21. ↑ "Iran to test-fire new missiles on Aug. 22". tehran times. Retrieved 2012-01-21. ↑ "PressTV - Iranian experts produce new unmanned aerial vehicle". Presstv.ir. 2012-03-17. Retrieved 2013-11-07. ↑ "Iran's IRGC produces new 24-hour airborne drone: Cmdr". Press tv. 2012-09-17. Retrieved 2012-09-21. ↑ "Iran releases images of drone production line". Press TV. 2013-02-08. Retrieved 2013-02-08. ↑ Cenciotti, David (2013-09-29). "Iran has unveiled a new drone based on a captured U.S. Boeing ScanEagle". The Aviationist. Retrieved 2013-11-07. ↑ "Iran stealth drone hamaseh, Epic 2013". YouTube. 2013-05-09. Retrieved 2013-11-07. ↑ "PressTV - Iran to unveil Hamaseh reconnaissance, combat drone". Presstv.ir. Retrieved 2013-11-07. ↑ ""رعد۸۵" پهپاد انتحاری ارتش ایران - مشرق نیوز". mashreghnews.ir. Retrieved 2013-11-07. ↑ "The Aviationist » Iran unveiled its new strategic UAV. The biggest domestic drone to date.". The Aviationist. 1 2 3 "Washington Institute". Washington Institute. 2008-09-26. Retrieved 2012-01-21. ↑ "Iran inaugurates 2 major defense projects to mark Ten-Day Dawn". Tehran Times. Retrieved 2013-11-07. 1 2 "اعلام هزینه ساخت شبیه ساز ایرانی - مشرق نیوز". mashreghnews.ir. Retrieved 2013-11-07. ↑ "ایران دومین سازنده شبیه ساز 214 - مشرق نیوز". mashreghnews.ir. Retrieved 2013-11-07. ↑ "تصاویر/ رونمایی از شبیه‌ساز متحرک بالگردهای 214 - مشرق نیوز". mashreghnews.ir. Retrieved 2013-11-07. ↑ "فیلم/بالگرد شبیه سازی شده 214 - مشرق نیوز". mashreghnews.ir. Retrieved 2013-11-07. ↑ "PressTV - Iran builds simulator for advanced sub". Presstv.ir. 2010-11-27. Retrieved 2012-01-21. ↑ "ŘŞŘľŘ§ŮˆŰŒŘą ŮžŘąŮˆŘ§Ř˛ Ř¨Ř§ Ů…ŰŒÚŻ 29 Ř§ŰŒŘąŘ§Ů† ŘŻŘą Ř´Ř¨ŰŒŮ‡ ŘłŘ§Ř˛ x". Aerocenter.ir. 2011-05-24. Retrieved 2012-01-21. ↑ "خبرگزاری بین المللی تسنیم - سامانه شبیه‌ساز میراژ و فاتح۱۲ رونمایی شد". Tasnim News Agency. Retrieved 19 December 2014. ↑ "شبیه ساز کامل متحرک ایران 140". Retrieved 19 December 2014. ↑ "شبیه ساز پایه ثابت ایران 140". Retrieved 19 December 2014. ↑ Shahin Aviation Technology. "Fokker 100 Simulator". Retrieved 19 December 2014. ↑ "No Operation". Presstv.com. Retrieved 2012-01-21. ↑ "Iran to equip Navy with sophisticated radar systems, vessels: Cmdr". PressTV. Retrieved 2013-11-07. ↑ "رونمايي از رادار بومي "عصر " و استفاده از آنتن مسطح براي اولين بار در کشور - مشرق نیوز". mashreghnews.ir. 2011-06-15. Retrieved 2012-01-21. ↑ "Uskowi on Iran - اسکویی در باره ایران: IRIN to mount Asr radar on IRINS Jamaran". Retrieved 19 December 2014. ↑ "جديدترين رادار ايراني، پرسرعت ترين قايق نظامي جهان و يک نوآوري مهم موشکي در رژه ۳۱ شهريور رونمايي شد". Khorasannews.com. Retrieved 2012-01-21. ↑ "Iran air defense to deploy new Thamen radar system soon". PressTV. Retrieved 2013-11-07. ↑ "Minister: Iran's military productions triple". tehran times. Retrieved 2012-01-21. ↑ "PressTV - Iran to produce 3000-km-range radar". Presstv.ir. 2010-11-14. Retrieved 2012-01-21. ↑ "PressTV - Iran develops long-range radar system". Presstv.ir. 2011-09-08. Retrieved 2012-01-21. ↑ "رادار نجم؛ چشم جدید آسمان ایران - مشرق نیوز". mashreghnews.ir. Retrieved 2013-11-07. ↑ "Iran officially unveils new long-range radar". Retrieved 19 December 2014. ↑ War Is Boring. "Iran Can Now Detect U.S. Stealth Jets at Long Range". Medium. Retrieved 19 December 2014. ↑ "با حضور امیر اسماعیلی رادار برد بلند "آرش" وارد چرخه عملیاتی پدافند هوایی شد+تصاویر". Retrieved 19 December 2014. ↑ "Iran's electronic warfare achievements significant". Retrieved 4 November 2015. ↑ "Fars News Agency :: Iran Shows Home-Made Warfare Equipment at Military Parade". English.farsnews.com. 2007-09-22. Retrieved 2012-01-21. ↑ "New missile marks 'significant leap' for Iran capabilities". Janes.com. 2008-11-14. Retrieved 2012-01-21. ↑ Pike, John (2011-07-24). 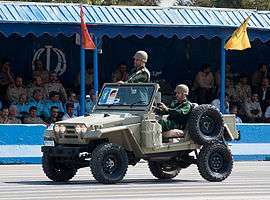 "Zelzal-2 / Mushak-200". GlobalSecurity.Org. Retrieved 2013-01-19. ↑ "Iran - Country Profiles - NTI". NTI: Nuclear Threat Initiative. ↑ Sheikholeslami, Ali (2010-08-20). "Iran Successfully Test-Fires New Surface-To-Surface Missile, Minister Says". Bloomberg. Retrieved 2012-01-21. ↑ "Defense Industry Daily". Defenseindustrydaily.com. 2005-12-23. Retrieved 2012-01-21. 1 2 "Iran starts production of two new missiles". Payvand.com. Retrieved 2012-01-21. ↑ "Weapon". Retrieved 19 December 2014. ↑ "خبرگزاری مهر :: Mehr News Agency - عکس خبری / افتتاح خط تولید و تحویل انبوه سامانه ضدزره دهلاویه". Mehrnews.com. Retrieved 2013-11-07. 1 2 Archived 6 February 2007 at the Wayback Machine. ↑ John Pike. "ZU-23 23MM Antiaircraft Gun". Globalsecurity.org. Retrieved 2012-01-21. ↑ "Iran Produces Anti-Aircraft Cannon: Samavat". YouTube. 2008-01-15. Retrieved 2012-01-21. ↑ "PressTV - IRGC receives anti-aircraft cannons". Presstv.ir. 2011-11-29. Retrieved 2012-01-21. ↑ "Iran tests anti-aircraft missile system". PressTV. 2011-04-16. Retrieved 2012-01-21. ↑ "Iran upgrades and successfully test launches S-200 SAM". YouTube. Retrieved 2012-01-21. ↑ "Fox News". Fox News. 2011-12-07. Retrieved 2012-01-21. ↑ "xinhuanet.com". News.xinhuanet.com. 2006-09-27. Retrieved 2013-11-07. ↑ "Iran builds anti-aircraft naval cannons". Payvand.com. Retrieved 2012-01-21. ↑ "Iran's first advanced air defense system becomes operational". tehran times. Retrieved 2012-01-21. ↑ "Iran starts mass production of Mesbah 1 air defense system". tehran times. Retrieved 2012-01-21. ↑ "Photos: Iran opens Mesbah 1 air defense system production line". Payvand.com. Retrieved 2012-01-21. ↑ "Iran, world, political, sport, economic news and headlines". MehrNews.com. Retrieved 2012-01-21. ↑ "Iran Starts Production of Advanced Radar System". Fars News. 2012-09-16. Retrieved 2012-09-17. ↑ "'Iran can disrupt military satellites'". PressTV. 2011-10-05. Retrieved 2012-01-21. ↑ "'Iran to Unveil New Missile Systems in Air Defense Drills'". Fars News Agency. 2012-11-13. Retrieved 2013-01-15. ↑ "امیر زواره‌ای در مراسم رونمایی از سه دستاورد جدید نزاجا مطرح کرد تلفیق توپ‌های پدافندی نیروی زمینی با پروژه موشکی سهیل". Farsnews.com. Retrieved 2013-11-07. ↑ "خبرگزاری فارس|گروه عکس|مراسم رونمایی از سه دستاورد نیروی زمینی ارتش جمهوری اسلامی ایران". Farsnews.com. Retrieved 2013-11-07. ↑ "سردار وحیدی در جمع خبرنگاران: دشمن توانایی اخلال در سامانه موشکی "حرز نهم" را ندارد". Farsnews.com. Retrieved 2013-11-07. ↑ "تصاویر/خط توليد پدافند هوايي حرز نهم - مشرق نیوز". mashreghnews.ir. Retrieved 2013-11-07. ↑ "Iranian Talaash Medium Range Air Defence System". Global Military Review. Retrieved 19 December 2014. ↑ "Iran rolls out another medium-range SAM". Retrieved 19 December 2014. 1 2 John Pike. "GBU-67/9A Qadr". 1 2 3 4 5 Galen Wright. "Iran's Indigenous Precision Guided Munitions". Retrieved 2014-02-23. ↑ "راسخون - توليد نسل سوم بمب‌هاي‌ هوشمند "قاصد " با برد 100 كيلومتر". Rasekhoon.net. Retrieved 2012-01-21. ↑ "Iran shows off missiles, troops during anniversary parade". Missile Threat. Retrieved 19 December 2014. ↑ "Iran announces new missile tests". Retrieved 19 December 2014. ↑ John Pike. "AGM-379/20 Zoobin". ↑ Cenciotti, David (2013-09-26). "Iranian F-14 Tomcat's "new" indigenous air-to-air missile is actually an (improved?) AIM-54 Phoenix replica". The Aviationist. Retrieved 2013-11-07. ↑ "PressTV - Iran test-fires latest indigenous air-to-air missile: Cmdr". Presstv.ir. Retrieved 2013-11-07. ↑ "Israel News - Daily News Alert from Israel". ↑ John Pike. "Kosar / Nasr". ↑ "FAS Military Analysis Network - C-802". Fas.org. Retrieved 2012-01-21. ↑ "تحويل انبوه موشك كروز "قادر" به نيروي دريايي سپاه و ارتش". Entekhab.ir. Retrieved 2012-01-21. ↑ "Iran launches mass-production of cruise missile". PressTV. 2012-02-04. Retrieved 2013-11-07. ↑ "Iranian Army plans to unveil tomorrow optimized version of its home-made main battle tank Zolfaqar". Army Recognition. 3 February 2013. 1 2 3 "Iran unveils new 12.7 mm Gatling gun". ↑ John Pike. "Tosan". Globalsecurity.org. Retrieved 2012-01-21. ↑ "JED The Military Equipment Directory". Jedsite.info. Retrieved 2012-01-21. ↑ "با حضور وزير دفاع دو نوع خودرو زرهي جديد رونمايي شد". Retrieved 19 December 2014. ↑ "Safir Jeep Mass Production". YouTube. 2007-12-25. Retrieved 2012-01-21. ↑ "خبرآنلاین - عکسهایی از سامانه خمپاره‌انداز و خودروی تاکتیکی کویران". Khabaronline.ir. Retrieved 2012-01-21. 1 2 3 4 5 "AIG". Diomil.ir. Retrieved 2012-01-21. ↑ "رونمایی از ۶ دستاورد بزرگ دفاعی ایران/ نقطه‌زنی موشک فاتح در هر شرایط آب‌و‌هوایی". Farsnews. Retrieved 2012-08-21. ↑ "خبرگزاری مهر :: Mehr News Agency - گزارش تصویری/ رونمایی از شش دستاورد صنایع دفاعی کشور". Mehrnews.com. Retrieved 2013-11-07. 1 2 "Iran Starts Mass Production of 120,130mm Mortar Shells". English.farsnews.com. 2010-02-09. Archived from the original on 1 March 2012. Retrieved 2012-01-21. ↑ "Iran unveils domestically manufactured self-propelled howitzer". Payvand.com. Retrieved 2012-01-21. ↑ "مهمات هوشمند و لیزری "بصیر" رونمایی شد+عکس - مشرق نیوز". mashreghnews.ir. Retrieved 2013-11-07. ↑ "Iran unveils new smart weapons system called "BASIR"". PressTV. 2012-01-30. Retrieved 2013-11-07. ↑ "Aerospace Industries Organization 107 mm (12-round) Fadjr-1 multiple rocket launcher system (Iran) - Jane's Armour and Artillery". Articles.janes.com. 2011-03-15. Retrieved 2012-01-21. ↑ "In the late 1980s, the North Korean-produced 240mm M-1985 multiple rocket launcher (MRL) was exported to Iran and subsequently produced under license (with minor changes) by Shahid Bagheri Industries as the Fajr-3 (a.k.a., Fadjr-3)." Vital Perspective (2006), "Military Briefing on Hezbollah's Missile Capabilities: Examining the Fajr, Zelzal". URL accessed 2006-08-02. ↑ "Fajr-3 has the same caliber, range and warhead weight as three known North Korean systems." GlobalSecurity.org (2006), "Iranian Artillery Rockets". URL accessed 2006-08-02. ↑ "Mashreghnews: Iranian snipers went from SVD to Taktab". Mashreghnews.ir. Retrieved 2013-11-07. ↑ "FarsNews". FarsNews. Retrieved 2013-11-07. ↑ Johnson, Steve (2013-03-07). "Iran's New Arash 20mm Shoulder Fired Anti-Material Rifle (With Barrett BORS Clone)". The Firearm Blog. Retrieved 2013-11-07. ↑ "رونمایی از سلاح جدید اخگر و خودروی رنجر بدست جوانان ایران". تکناز. Retrieved 19 December 2014.